8' 3" x 9' 5"
The Mazandaran kilims produced for local use in the Caspian region of Northwest Iran represent one of the most authentic traditions of Persian rug weaving, although their minimalist approach to design often appears strikingly modern in its graphic simplicity. 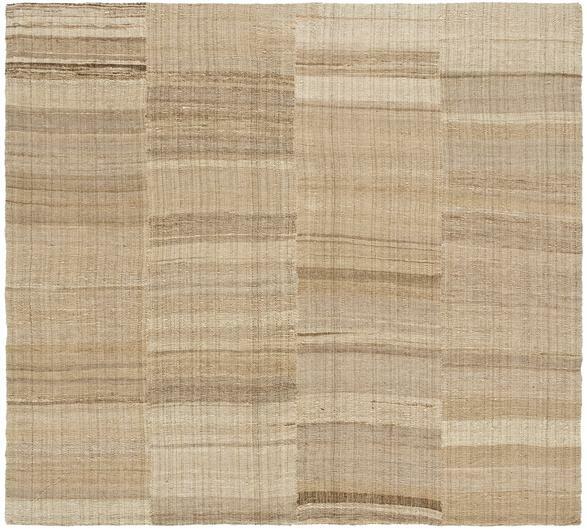 Here the design consists entirely of irregular horizontal stripes or bands in alternating light and dark tones. Each vertical section was woven separately, with the relative width of the horizontal bands determined spontaneously. The various columns were then sewn together and jogged to attain a staggered effect in the bands. Each of these kilims is therefore distinct, despite the fact they tend to use the same design principle. The modulations in the tonality with extensive variegation of color or ‘abrash,’ gives each piece a special presence all its own, with a distinctive visual as well as physical texture. Here the all natural, undyed colors have a particularly varied abrash suggesting the appearance of exotic wood grain rather than a textile. The bold, thick weave also has a sculptural relief effect as well, with additional diagonal embellishments sewn into the intersecting warps and wefts.